As the Congress moves forward into the 2019 Lok Sabha elections, it not only needs to strengthen the state units and reach out to the grassroots level, but also forge alliances with like-minded parties. With the Congress being seen on a path to resurrection post electoral successes in Chhattisgarh, Rajasthan and Madhya Pradesh, political pundits feel it is still faced with the twin challenge of building strong anti-Bharatiya Janata Party coalitions and strengthening its state organisations. Buoyed with electoral gains in these three states, the grand old party is now in power in a total of six states including Punjab, Karnataka and Puducherry, but the real challenge before the Congress is defeating the BJP in the 2019 Lok Sabha polls and it is widely felt it would need help of other opposition parties for that. For the moment, the Congress has stemmed its electoral decline by sweeping Chhattisgarh and edging out the BJP in Rajasthan and Madhya Pradesh, signalling its preparedness for 2019 elections which are building up as a "BJP-versus-all" battle. The fact that it just missed the majority mark on its own in Rajasthan and Madhya Pradesh underscores the continuing importance of bringing allies on board. Its loss in Telangana, despite forging an alliance with the Telugu Desam Party, also brings out the party's internal organisation weaknesses. The victory sealed by regional forces in Telangana, as also in Mizoram which is the latest state to slip out of the Congress fold, in the just-concluded assembly polls also underscores the importance of non-BJP and non-Congress parties in a politically diverse democracy. Telangana's loss comes despite the Congress being seen by its leaders and many others as its creator and Sonia Gandhi making a fervent appeal to the electorate there. In Madhya Pradesh, the Congress had to seek the support of the Bahujan Samaj Party and the Samajwadi Party both to form a government and in Rajasthan also the Congress had to seek the support of two independent MLAs to reach the majority mark in the 200-member state assembly. Congress president Rahul Gandhi appears to be conscious of the relevance of workable anti-BJP coalitions for challenging the BJP in 2019 and said in his victory speech that a resurgent Congress and a combined opposition will make a difference to defeat the BJP. While the need for various parties to fight 2019 polls unitedly has been stressed by many opposition leaders, Samajwadi Party's Ram Gopal Yadav said that the Congress needs to treat the opposition in a better way, while noting that the moment Congress gets strong it does not treat the opposition well. He also felt that the results of these assembly polls could have been better had the Congress leadership coordinated well with the SP. 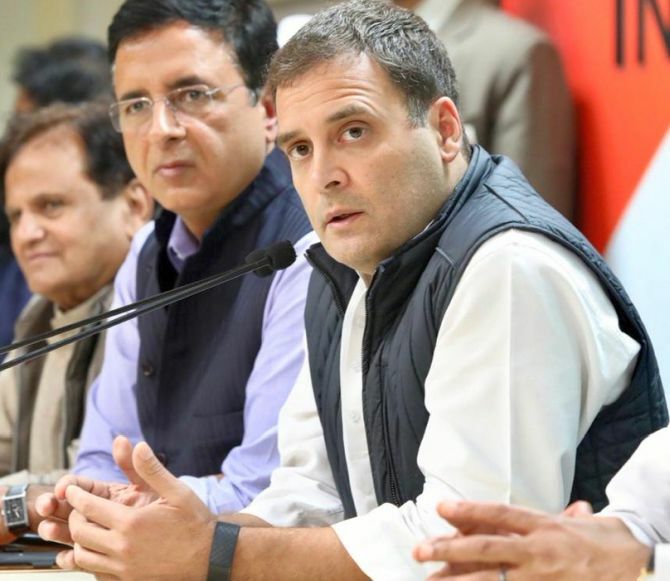 Congress chief spokesperson Randeep Surjewala said his party will build a people's narrative, a positive paradigm and a module to find lasting solutions to the "pain caused by the Modi government at war with its own people". "We will carry everyone along in this battle, despite our ideological differences, in order to save democracy, save the Constitution and protect the integrity of out institutions intrinsic to the very subsistence of our polity," he said. Former Union minister and senior Congress leader Ashwani Kumar said the spectacular victory of his party in assembly elections is a clear pointer to the "decimation" of BJP in 2019 elections. "It is also imperative, however, for the Congress to lead in the formation of a winning secular alliance against the BJP in order to avoid the fragmentation of votes," he said. Kumar also said the organisational inadequacies of the party, wherever noticeable, have to be addressed on a war-footing and a clear picture of intra-party unity at all levels needs to be demonstrated. "It is equally important for us to focus on the core issues of the people where Prime Minister Narendra Modi has miserably failed to deliver. The 2019 election will represent a choice of the Indian people between freedom and fear, besides inclusion and exclusion," he said. As the party moves forward into the 2019 Lok Sabha elections, it not only needs to strengthen the state units and reach out to the grassroots level, but also forge alliances with like-minded parties, said another party veteran.